Growing up openly Jewish (that is, everyone at my public school knew I was Jewish) meant occasionally encountering the highlights of anti-Semitic stereotypes: that the Jews have physical disfigurements (middle school), that the Jews brainwash people (high school freshman English class), that dirty Jewish money secretly bankrolls most of the evil doings in the world (college roommate), that Jews who support Israel in any form are the embodiment of genocide and hate (college again), that the Jews are both a problem and cause problems (pretty much all over Europe). As any minority well knows, to be attacked in such a way is uniquely scary, tongue-tying, and confusing, especially when you don’t have the right language tools to fight back. So when Congresswoman Ilhan Omar tweets about Israel “hypnosis” and “Benjamins” financing American foreign policy, although she doesn’t call out Jews explicitly, I can appreciate why many (though not all) Jews hear in her phrasing the same anti-Semitic motifs they had to grow up with, which go back hundreds of years. When she pleads for “Allah” to “awaken the people” in regards to Israel, many Jews can’t help but hear religious overtones: that this isn’t about criticizing Israeli government policies, this is about Muslims vs. Jews. There is absolutely a way to criticize Israeli government policies without resorting to anti-Semitism. I do it all the time. Anti-Semitism and criticism of Israel are not the same thing. But they become the same thing when those who criticize Israel reach for classic anti-Semitic motifs that paint Jews as particularly nefarious. When Rep. Omar claims that Jewish money buys off politicians to support Israel, it’s both not true AND a classic anti-Semitic theme about Jewish money being used for sinister purposes (i.e. controlling governments). Same thing when she says that Israel is “hypnotizing” the world into supporting it. Again, not true AND goes to a classic accusation that Jews use dark magical powers to coerce innocent non-Jews into doing their bidding. So when she says these things, many Jews hear attacks on them as a people instead of a thoughtful critique of Israeli government policies. 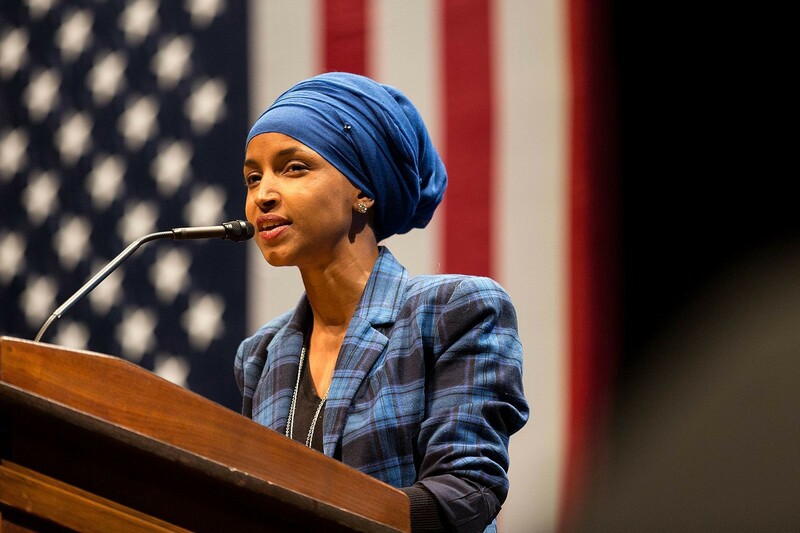 Finally, when Rep. Omar limits her attacks to Israel, making Israel the sole bad guy in the complex interplay of conflicts between Israel and the Palestinians, Israel and the Arabs, the Arabs and the Palestinians, Jews and Muslims and Christians and Druze and everyone else, she indicates an intellectual dishonesty that finds blame solely with “the Jews” (and their money and hypnotizing skills), and not a thoughtful understanding of the many dynamics at play in the Middle East, of which the Palestinians certainly have their own faults. On its own perhaps Rep. Omar’s use of language could be explained away by ignorance. After all, she didn’t grow up Jewish, so I doubt she was sensitive to all these nuances. And that’s okay. I didn’t grow up Muslim, or as a member of any other minority, so I am certain there are plenty of distinctions that I still today don’t pick up on. Therefore, if I was to discuss a hot-button issue regarding Islam, I would try to be mindful of the fact that I have not had the same lived experience with Islam as Rep. Omar, and try to monitor my language accordingly. I might not realize that something I said could be heard by Muslims as Islamophobic, and would therefore stand corrected when they called me on it. What is disconcerting, then, for many Jews is Rep. Omar’s seeming lack of awareness of how her language is coming across. She not only uses the classic language of anti-Semitism but also singles out Israel as the sole “evil” responsible for the Conflict in the Middle East today. She betrays no deeper understanding of the Conflict than that it’s all Israel’s fault. No mention of Palestinian terrorism. No mention of Palestinian politics, in which violent and corrupt tyrants keep ordinary Palestinians in a state of oppression. Earlier this week Egypt pumped poison gas into a smuggling tunnel underneath its border with Gaza, killing two Palestinians and putting several others in the hospital. I didn’t see a single tweet from Rep. Omar condemning this attack against the Palestinians. Why? What would she have tweeted if Israel had done that? In other words, what many Jews see is a sole focus on Israel, PLUS no display of nuance or deeper understanding of the Conflict, PLUS the use of classic anti-Semitic language. Add that up and, well, you get anti-Semitism. How do you know? Natan Sharanksy, the famous human rights activist, memorably defined how criticism of Israel becomes anti-Semitic: when it involves demonization, delegitimization, and double-standard. When you demonize Israel through stereotypical accusations about Jewish power and control (“the Benjamin’s”) and nefarious Jewish plots (“hypnosis”), that is anti-Semitic. When you delegitimize Israel by falsely claiming that it is a racist regime, that is anti-Semitic. You can dislike its political leadership all you want (which is completely valid) but Israel is not a “regime,” it is a legitimately-elected democratic government (which isn’t true for plenty other places where Palestinians live). Nor is it apartheid, which is defined by race. Most Jews in Israel today are of Middle Eastern background; the Conflict isn’t between races, it’s between nationalisms. And when you hold Israel to a double-standard that you don’t apply to any other countries or people (i.e. failing to criticize Egypt, Syria, Lebanon, or anyone else for their treatment of the Palestinians), that is anti-Semitic. There are plenty of ways to be an advocate for Palestinians in the U.S. Congress that don’t involve taking cheap shots at the Jews. Trump’s funding cut for Israeli-Palestinian coexistence programs seems worthy of genuine debate and could make for some great tweets. Rep. Omar would find a lot of support in the Jewish community for a sincere consideration of this issue on its merits. The problem with Rep. Omar is that she pushes too many buttons to pass it off as a mere misunderstanding or legitimate criticism of Israel. It’s the totality of her comments, not individual tweets, that lead many Jews to feel that she is crossing the line into anti-Semitism. It’s just too many “dog-whistles” around classic stereotypes. Her begrudging apologies make it worse, since it is clear that she either doesn’t fully appreciate, doesn’t want to address, or simply rejects the impact this has on many members of the American Jewish community. Jason Harris is a Jewish educator and former congressional staffer in the San Francisco Bay Area. He is the creator and host of the podcast Jew Oughta Know.